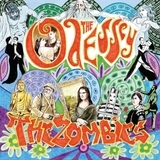 Edited by Basil Rogger, Jonas Vögeli, Ruedi Widmer. Text by Michelle Akanji, Friedrich von Borries, Delphine Chapuis, Teju Cole, Hans-Christian Dani, Steven Duncombe, Anna Feigenbaum, Philipp Felsch, Marleen Fitterer, Meret Fischli, Corinne Gisel, Johannes Hedinger, Knut Henkel, Henriette Herm, Larissa Holaschke, Ines Kleesattel, Wolfgang Kraushaar, Wong Chi Lui, Elisio Macamo, Eva Mackensen, Franziska Meierhofer, Tine Melzer, Rabih Mroué, Maybell Eequay Reiter, et al. From the South in the 1930s to Tahrir Square today, Protest examines how art and the image have been used by protest movements to whittle down the powers that be. 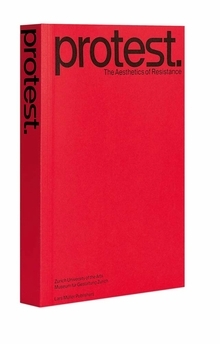 Kirkus writes, "This comprehensive, smart analysis of the art of protest features art designed to rattle politicians’ or consumers’ nerves but also memorable photography of protests." 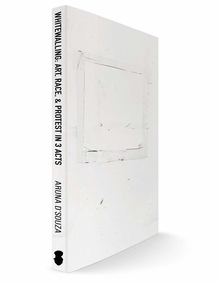 Drawing on writers across the world and across disciplines, Protest offers a contemporary and comprehensive analysis of the "Aesthetics of Resistance," or as The New York Times sums it up: "this survey of the visual slogans that have been used as tools for social change over the last half-century reveals how blurred is the line between politics and poetics, art and life." Included in the Kirkus and Vulture Holiday Gift Guides. Paperback, 6.25 x 9.5 in. / 448 pgs / 126 color / 73 bw. 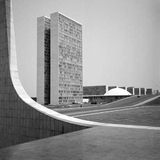 Is democracy spatial? How are the physical aspects of our cities, houses, streets, and public spaces—the borders, the neighborhoods, the monuments—bearers of our values? In a world of intensifying geo-economic integration, extreme financial and geopolitical volatility, deepening environmental crises, and a dramatic new wave of popular protest against both authoritarian government and capitalist speculation, cities have become leading sites for new claims on state power and new formations of political subjectivity. 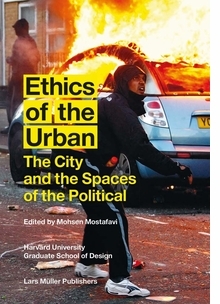 This volume brings together perspectives from history, sociology, art, political theory, planning, law, and design practice to explore the urban spaces of the political. 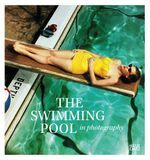 A selection of contemporary photography from around the world offers a visual refl ection of this timely investigation. Foreword by Bill Brown. Preface by Jonathan Solomon. Introduction by Niall Atkinson, Ann Lui, Mimi Zeiger. Essays by Ingrid Burrington, Dan Handel, Ana María León, Nicholas de Monchaux, Jennifer Scappettone, Imre Szeman. 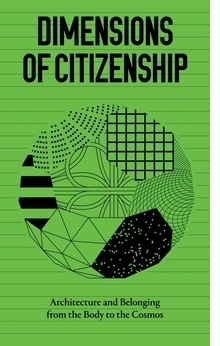 Profiled in Steven Heller's Print magazine column, this "timely and significant" book documenting contributions from the seven firms selected to represent the United States in the 2018 Venice Architecture Biennale was also first on Inc.com's "19 Books Everyone Who Wants to Succeed Should Read," where Christina DesMarais writes, "Dimensions of Citizenship is a colorful, digestible guide to the late 21st century and the role that architects play or don't play in shaping our collective understanding of citizenship. Connecting theory with social, ecological, and aesthetic concerns, [this book] maps the social dimensions of indifference across people and cultures making it a compelling read for any entrepreneur or business leader who is passionate about instilling ethics and values into their work." Paperback, 4.25 x 7 in. / 264 pgs / 40 color / 50 duotone / 50 bw. Jim Marshall: Peace collects the beloved photographer’s previously unseen “peace” photographs, taken mainly between 1961 and 1968. 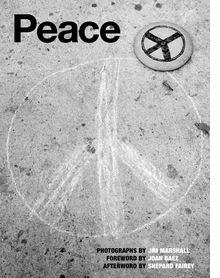 Photographing across America, Marshall charted the life of a symbol, documenting how the peace sign went from holding a specific anti-nuclear meaning to serving as a broad, internationally recognized symbol for peace. Marshall captured street graffiti in the New York subway, buttons pinned to hippies and students, and West Coast peace rallies held by a generation who believed, for a brief moment, they could make a difference. The Campaign for Nuclear Disarmament (CND) symbol, also known as the peace sign, was designed in 1958 by Gerald Holtom for the British Campaign for Nuclear Disarmament. When the design spread from the UK to the American anti-war campaign, it caught the eye of Marshall, who saw himself as an anthropologist and journalist documenting the changing times of the 1960s. In between official assignments, Marshall started photographing the symbol and peace rallies as a personal project. He tabled these images on an index card in his archives labeled “Peace,” where they remained, until now. Born in Chicago, Jim Marshall (1936–2010) grew up in San Francisco, teaching himself photography by portraying musicians in the coffeehouses of North Beach. After a brief stint in New York, Marshall returned to San Francisco, where he continued to cement his reputation as a formidably talented music photographer. Marshall holds the distinction of being the only photographer ever honored by the Grammys with a Trustees Award for his life’s work. Shepard Fairey was born in Charleston, SC and received his Bachelor of Fine Arts in Illustration at the Rhode Island School of Design in Providence, RI. As a student there he created the “Andre the Giant has a Posse” sticker that transformed into the OBEY GIANT art campaign, which has changed the way people see art and the urban landscape. His work which includes the 2008 "Hope" portrait of Barack Obama, now owned by the Smithsonian’s National Portrait Gallery. In addition to his guerrilla street-art presence, the artist has executed more than 75 large-scale painted public murals around the world. His works are in the permanent collections of The Museum of Modern Art, the Victoria and Albert Museum, the Smithsonian’s National Portrait Gallery, the Boston Institute of Contemporary Art, the San Francisco Museum of Modern Art and many others. Hardcover, 6.75 x 9.25 in. / 128 pgs / 120 bw. A feminist silkscreen poster collective founded in London in 1974 by three former art students, the See Red Women’s Workshop grew out of a shared desire to combat sexist images of women and to create positive and challenging alternatives. Women from different backgrounds came together to make posters and calendars that tackled issues of sexuality, identity and oppression. 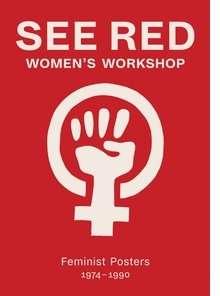 With humor and bold, colorful graphics, See Red expressed the personal experiences of women as well as their role in wider struggles for change. Written by See Red members, detailing the group’s history up until the closure of the workshop in 1990, and with a foreword by celebrated feminist historian Sheila Rowbotham, See Red Women’s Workshop features all of the collective’s original screenprints and posters. Confronting negative stereotypes, questioning the role of women in society, and promoting women’s self-determination, the power and energy of these images reflect an important and dynamic era of women’s liberation—with continued relevance for today. Paperback, 8.75 x 12.25 in. / 184 pgs / 90 color / 25 bw. 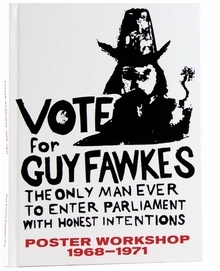 From 1968 to 1971, anyone could drop in to the basement in Camden Town, London, and commission a poster from the Poster Workshop. In walked workers on strike, tenants associations, civil rights groups and liberation movements from all over the world. Inspired by the Atelier Populaire (protagonists of May '68), the workshop created posters that could be made quickly to respond to what was needed, on a great number of themes: Vietnam, Northern Ireland, South Africa, housing, workers' rights and revolution. The Poster Workshop existed at an exceptional time. It thrived on the energy generated by the belief that huge changes were possible, through movements for equality, civil rights, freedom and revolution. The posters made there show the extraordinary diversity of those who came to the workshop and provide a microcosm of much that was happening nationally and internationally. Including many unseen and previously unpublished screen prints by 1960s activists, this book gives a unique perspective on the key political issues of the 1960s as told through the protest posters of artists and activists. Hardcover, 6.25 x 8.75 in. 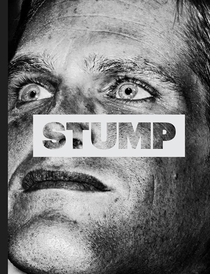 / 128 pgs / 140 color / 100 bw. This comprehensive monograph gathers images of spectacular events and daily life alike. Included are photographs of Civil Rights and anti–Vietnam War protests in the 1960s, the peace march held in 1962 in response to the Cuban Missile Crisis and images of Martin Luther King after his 1968 speech at Carnegie Hall. 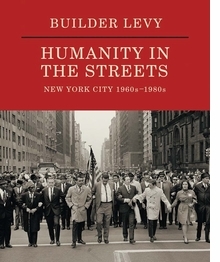 Also included are shots of the poverty-ravaged Brooklyn of the 1960s, '70s and '80s; the innercity communities where Levy worked as a public school teacher for almost 35 years; and marches and demonstrations in support of local causes like quality education for all NYC children and an end to police killings. Builder Levy (born 1942) was born in Tampa, Florida, and raised in Brooklyn; he studied photography at Brooklyn College. 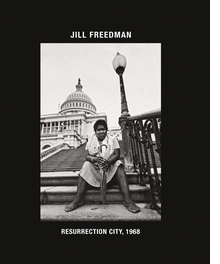 His photographs are included in more than 80 public collections, including that of the International Center of Photography, the Brooklyn Museum, the Smithsonian National Museum of African American History and Culture, the High Museum of Art, the Ringling Museum of Art and the Victoria and Albert Museum. Levy lives in New York. Hardcover, 9.75 x 12 in. / 124 pgs / 100 bw.